For some reason recently my designer files will no longer open with designer when I select them. They default to opening with Photo. I can right click and then choose to open with Designer. The extra click is slightly annoying but I can still work with my files. Weirdly but I can't fix it permanently. First, I chose get info; but I couldn't change the file options there either as the movie below demonstrates. Then I tried uninstalling & reinstalling both photo and designer. This might have all begun when I installed the Publisher beta. I'm not sure. Probably did start with Publisher Beta, the Mac does weird stuff. I have no experience with Mojave but the OS has bitten me this way more than once over the years. Preamble over. Select (in the finder) an Affinity Designer file and get info. Where it says Open With select Affinity Designer and then hit the little Change All... button. I've never seen anything quite like in your screen recording with our files, I'll certainly keep an eye out for this with the Publisher beta and if I can replicate the issue I'll make sure our dev team are aware. In the meantime, you can right click on an .afdesign file, select Open With > Other... then choose Affinity Designer from the list and select Always Open With at the bottom of the window. Hopefully this will fix your defaulting program! Unfortunately this isn't possible for them, as in the provided video the Mac Apps list isn't allowing him to select Affinity Designer before selecting Change All! Actually, it is possible, but it immediately changes back to Affinity Photo. I suspect this has something to do with the file being in iCloud Drive in the Affinity Designer folder, but I have no idea how there could be anything in the badged folder with that name other than .afdesign files that would always open from iCloud Drive in Affinity Designer. I have no idea how there could be anything in the badged folder with that name other than ﻿﻿.afdesign files﻿﻿ that﻿ would always open from iCloud Drive in Affinity Designer. Me neither currently! 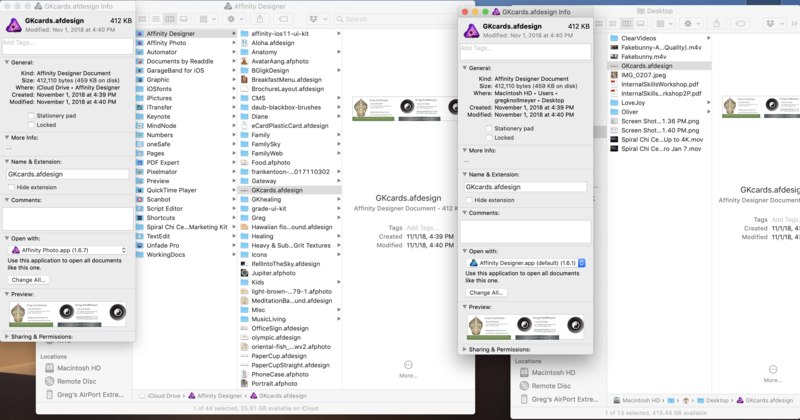 Equally as strange is that one .afdesign file is marked as an Affinity Designer Document under Kind in the video, and the other is marked as an Affinity Openable. I'm more of a Windows man myself, have you seen this before in MacOS? have you seen this before in MacOS? 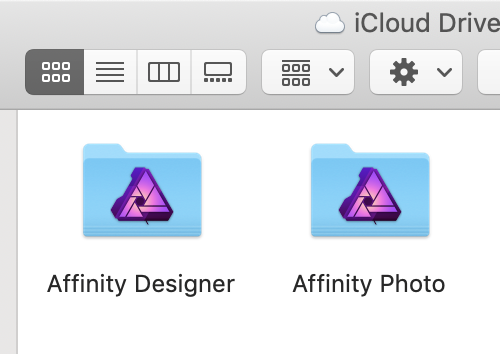 I have a pair of iCloud Drive folders 'badged' with the Affinity Photo & Affinity Designer logos respectively. They were created automatically by the iPad versions of those apps. With the respective iPad app preference "Default Save Location" set to "iCloud Drive," this is where the iPad app save files from its Home screen's menu, so normally I store only .afphoto or .afdesign files in the respective folders. In the Mac Finder these special 'badged' folders are identified as "Kind: App Library" & their folder names cannot be changed, either from the Mac Finder or the iPad Files app. Likewise, the default app for opening anything in those folders cannot be changed (technically, in the Mac Info window it can be changed but immediately reverts to Photo or Designer respectively). So for example anything in the 'badged' iCloud Drive > Affinity Designer folder that Affinity Designer can open always defaults to Affinity Designer & likewise for the 'badged' Photo one. That includes .afphoto files placed in the Designer "App Library" folder & .afdesign files placed in the Photo "App Library" folder. So basically, I see the opposite of what @gregspiral sees -- it is the "App Library" folder that determines which app will open the file by default, not the file extension, & that cannot be overridden from the Mac Info window. Also, for either of these library folders this also includes PNG, JPEG, etc. files. 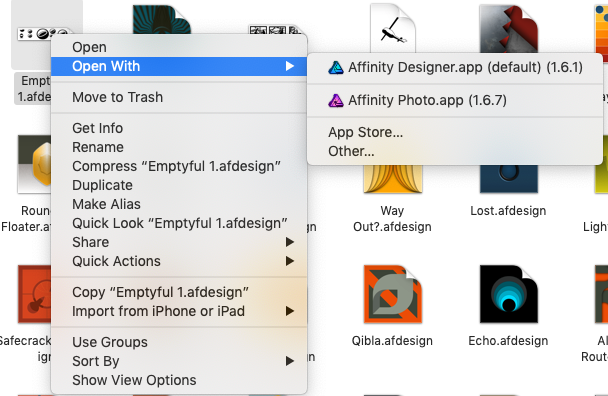 Because I have set my Mac to default to opening PNG files in Designer, the Mac Info window always shows them as "Kind: Affinity Openable," no matter what folder they are in. My Mac is also set to default to opening JPEG files in Preview.app. However, no matter what folder they are in, they are always shown as "Kind: JPEG image." But regardless of the Kind, if the file is in either of these two special library folders, the info window "Open with" section says they will use the respective Affinity app to open files like it (& that cannot be overridden), while if they are in any folder other than those two folders, then the default app can be changed in the usual Mac way like @Old Bruce mentioned. That also is different from what the @gregspiral movie shows, because for the file his second Info window shows as "Kind: Affinity Openable" the extension is .afdesign, not PNG, JPEG, or any of the other non-native filetypes Affinity can open. I hope somewhere in all my blather there is a clue that will help solve this but I certainly can't see what it might be. In the Mac Finder these special 'badged' folders are identified as "Kind: App Library" & their folder names cannot be changed, either from the Mac Finder or the iPad Files app. I knew my instinctive distrust of the various flavours of 'cloud' storage was right. Thanks for the detailed explanation of how this particular (iCloud) system can bite me. I don't know much about the other cloud storage flavors like Dropbox but FWIW I have never had anything like the problem(s) @gregspiral is experiencing with Apple's iCloud Drive (not quite the same thing as iCloud). The IOS 12 file management options provided by the iOS Files app are still quite limited & a bit confusing vs. the ones available in desktop operating systems, but aside from that I have found no reason to distrust it. At least for me, it works quite reliably for quickly moving/copying files between my Mac & iPad. Apple offers 5 GB of storage for free or 50 GB for $1 USD a month so with a little bit of manual file management to keep from exceeding those limits (& to backup the stuff I care about to external drives connected to my Mac) it is a very good fit for me. I used DropBox but 2GB is just mean in todays world, MEGA is a better option with 50GB Free and its encrypted, I think you have to pay for the encrypted privilege with DropBox. Another thing with dropbox, is they offer you more space, i.e. I bought a Samsung phone and they gave me 8GB, they they decided to take it back off of me, that wasn't a promo offer either, same thing with a Dell Laptop, they gave me 20GB and took it off me but that was a promo. I call this a bit of a dirty trick because all of a sudden you get these lovely messages and if you forget to move or download your files, it's goodbye files above 2GB. This is why I moved to MEGA. I think the OP's problem could probably have to do with iCloud synchronisation, which was a known issue with early macOS Mojave versions. - @R C-R do you actually too use macOS Mojave and do things like sync with iCloud drives work flawlessly for you there for Affinity based files? @R C-R do you actually too use macOS Mojave and do things like sync with iCloud drves work flawlessly for you there? I don't (yet) use Mojave -- everything in my sig is to my knowledge up to date & accurate. But regardless of that, you may be thinking of the iCloud sync services that can automatically sync Apple Photos libraries, Safari bookmarks, Mail messages, contacts in Apple's Contacts app, & so on that are created on one device with other devices running the same app. iCloud Drive is a bit different in that it is just an alternative storage location "in the Apple cloud" where if desired files can be saved & downloaded to a local device to use them. It does not provide any automatic syncing of its own; that has to be done manually in the Mac Finder, in the iOS Files app, or via preferences built-into iOS apps like those in the Affinity iPad ones. That all works flawlessly for me, as do the few automatic sync services I use. I've read on the net that there were previously some such problems in macOS Mojave versions for some Apple and third party software, so it might be that there are still some slightly glitches and bugs related to this in Apples newest OS versions. I did a quick & admittedly not very thorough web search for this. While I did find some reports of issues, most of them seemed to be related to the betas, to general install issues, or to iCloud syncing with specific Apple apps like Mail, Contacts, or Photos. I did not find anything about syncing with third party apps. The only thing I found specifically about iCloud Drive was a few reports of not being able to connect to it at all. That does not seem to be related to the issue @gregspiral has -- the Info windows in his video show the two files are in iCloud Drive so it seems safe to assume he can connect to it. There were some reports about Finder not refreshing when files were moved or deleted, but that doesn't seem to be a likely cause for the issue here either. Anyway, for most of the issues the recommended fix was to start the Mac in Safe Mode, & then restart normally. That might be worth a try since it is very easy to do. If that doesn't help, the most often suggested fix for iCloud sync issues was to just open System Preferences > iCloud & sign out & then sign back in. Since iCloud Drive does not really provide any sync services, I doubt that would do any good, but it is maybe worth a try anyway -- again, it is very easy to do. When I do what your clip shows, my other devices do not automatically download the files I add to the iCloud Drive. I am also experiencing my Designer files now showing the icon for Affinity Photo while the file extension is af.design and they open in Affinity Photo. I checked properties and it says This a designer file created in Affinity Designer. I have a Windows 10 computer and rarely save any files to the cloud: definitely not Affinity files and none this year. I do have Affinity Publisher beta, though I have only just noticed the issue with the files. I did use "edit in Photo" last night prior to noticing this issue,(whether there before I do not recall). I have checked my Affinity photo files and they are still the same and unaffected. I just closed one designer file opened from the recent list in Affinity Designer and was asked as if still a Designer file. However it still has the Affinity logo in the file system. Will this clarify the issue and is there a solution yet. To (maybe) clarify a bit about iCloud automatic syncing, as I understand it, it applies to Apple apps like Mail, Contacts, Safari, etc. They can be set in macOS System Preferences or in iOS Settings on a per app basis to automatically update data on multiple devices, so that each device has a synced local copy of the same data like email messages, contacts, Safari bookmarks, & so on. In addition to that, there are three iCloud options for Apple Photos, one of which (iCloud Photos) automatically uploads all Photos photos & videos to iCloud, & may or may not retain local copies of some of them on devices, depending on the available storage space on the device. iCloud Drive is different. It is basically just a remote storage location, much like a network drive (thus "Drive" in the name). iCloud Drive does not automatically upload anything without some kind of user interaction (like when you drag files into it from Finder), nor does it automatically download anything to other devices without some user interaction, like opening the file in an app on a particular device. I hope this makes sense. Apple does not make how each of the iCloud options differ very clear. Since the Affinity apps do and can share (reuse vice versa) their own file format, I assume the app to use and which in turn then starts up an associated file is identified (first of all) due to the file extension from the respective operating system. - There might be circumstances where either OS gets puzzled here and overwrites default settings or registry entries, which then do affect the overall associated startup app to pass over as default to open the file. Don't know if this actually might play any role here and possibly causes the file association troubles. So I do not want to rule that out, but similar problems sometimes happened and existed before, meaning before Publisher Betas even already existed. Thanks for all the replies. As of yet, the notion of folder type seems most likely to me perhaps as a complication with publisher beta. I tried to do a little testing. First I can open the Designer files on iPad, save changes to cloud, and continue working in Designer on my Mac. I just still need to right click and choose "open with". Next I copied an afdesign file to my desktop. I used cmd I to get info on that file and was seemingly able to change all afdesign files to open with Designer. When I double click on the file on the desktop, it opens just fine into Designer. However, it still shows a the Photo logo when I do cmd I.
afdesign files in iCloud still open with photo when double clicked. Below you can see a picture of the same file on desktop and in iCloud Drive. If I copy an afdesign file out of iCloud and double click on it, it will open with Designer. But always it has the wrong logo. I would have thought that this was simply some sort of Mac issue; but v_kyr is showing something similar and also had the publisher beta. I am confused as to what has happened. All of my designer files are now correct. All I did was check the forum this morning, then open a designer file in Affinity Designer to Save As and reuse. When I got to the location the message said I had already created the file I wanted, so I cancelled the save as operation. All of my Affinity files were corrected. Did it self-correct or did cancelling the Save As operation have an influence? Here is a screenshot to show how the properties of the Affinity Files have now changed from the previous one in my earlier post. I have a Windows 10 operating system on my laptop. I created an account specifically to reply here. I am experiencing the EXACT same problem as the original poster, but I don't have the Publisher beta installed. I'm also experiencing a lack of proper syncing between the iPad and mac versions of Designer, and am wondering if this bug is the culprit. This is client work that NEEDS to both sync properly, and be safeguarded against data loss. I would sleep easier knowing that my files and data are being properly safeguarded. EDIT: apologize for the size of that screen recording. Just dragged it in. I'm sorry to see this, does the following fix your association issue? I don't think I mentioned that I tried what Dan C. suggested earlier and had no luck. Whether I try to change file associations with Get Info or " Open With > Other... then choose Affinity Designer from the list and select Always Open With at the bottom of the window." it doesn't work. 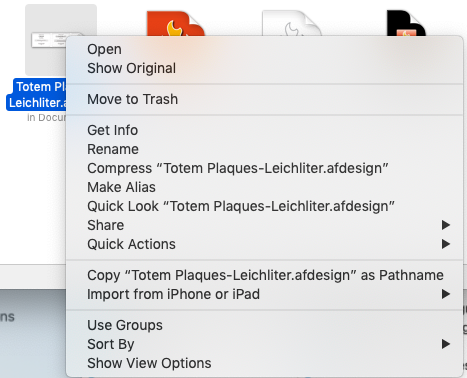 Right clicking and choosing Designer from open with or open with other works for the moment but doesn't fix the files within iCloud Drive. Different from emptyful, as long as I save the iOS files after closing them, they sync just fine via iCloud. My problem is an annoyance that would be great to fix; but is not a data loss issue. Emptyful, I do remember when I first started working with Designer on iOS I didn't realize that I had to save a file if I chose "open from iCloud". Not only do we need to navigate out of the file; but also then choose save from the menu. I made a little video showing what I mean. The screenshot from my Mac shows the file automatically updating. Anyway, if you're not using that extra step, doing so will likely fix the syncing issue you're seeing. Hi Dan - thanks for the welcome! 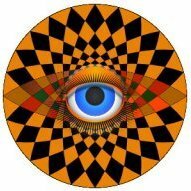 gregspiral - thanks for your help. I've been doing exactly the same procedure that you show in your videos. It was one file, started on the iPad, then edited extensively on my mac, that was failing to sync. I ended up closing it on the iPad (from within Designer), then importing the new file from my iCloud drive. Worked fine, and has been syncing properly since. Mysterious and a bit unsettling. OK, here's another bit of information. 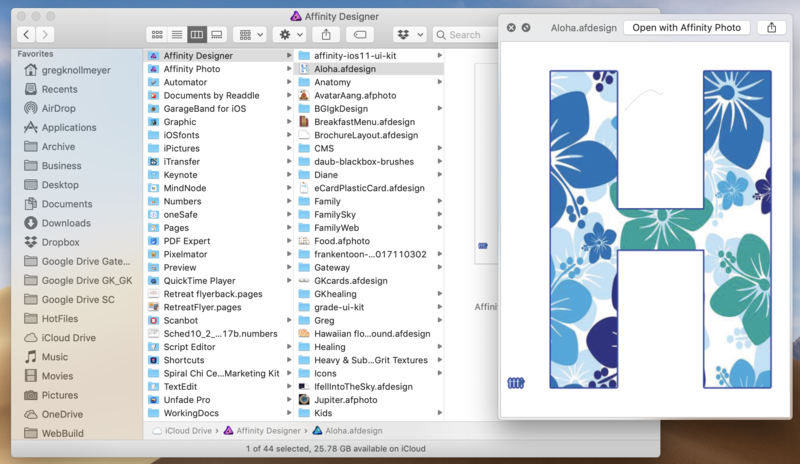 I have another .afdesign file who's icon appears in the Affinity Designer folder on my iCloud drive, but the file itself is actually in my Documents folder (also on the iCloud Drive - notice how you can just see the "In Documents" note beneath the filename? I'm guessing that's a symlink or alias or some such, right?) That file DOESN'T exhibit the behavior (double-click opens it in Designer), and the right-click menu gives no option for which program to open it with. See the attached images. Hopefully I haven't just confused things even more.